Benefits of Antibacterial Wipes in Healthcare. 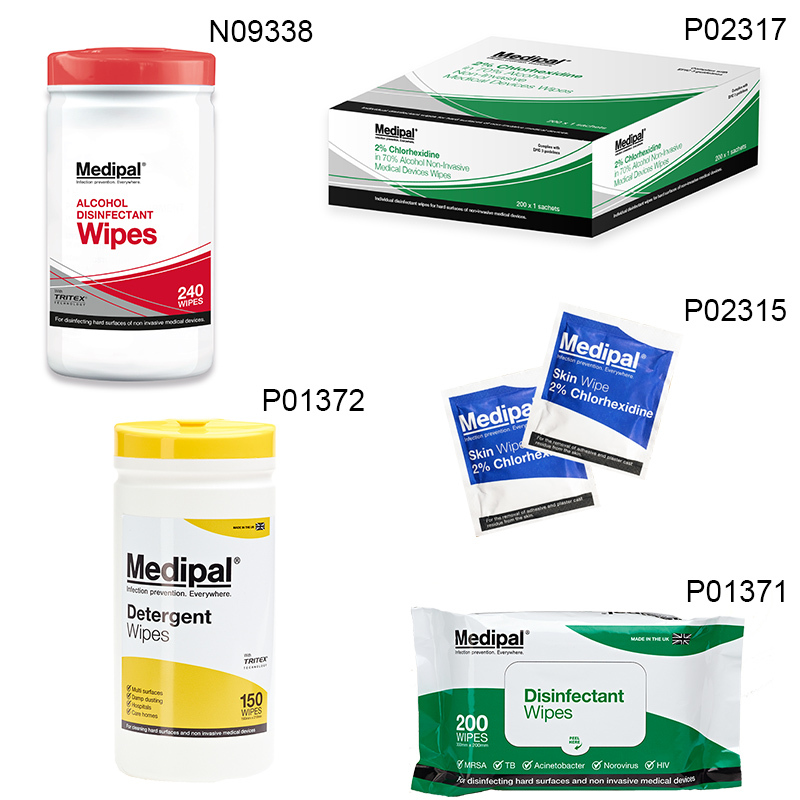 Medipal® Disinfectant Wipes are intended for cleaning and disinfecting surfaces of non-invasive medical devices and equipment in healthcare and care environments. Medipal® Disinfectant Wipes contain a dual biocidal solution which is highly effective against a wide range of microorganisms. Hospitals and care facilities are moving away from traditional methods of environmental cleaning. Pre-soaked, ready-to-use and disposable wipes are increasingly used for the disinfection of near-patient surfaces to prevent the spread of microorganisms and the emergence of nosocomial infections. Typical issues that arise from using traditional methods (multiple-use towels, wrong dosage or repeated dipping) can be avoided by using disposable wipes. Ready-to-use cleaning and disinfection wipes have been shown to lead to significant higher compliance, a more rapid cleaning and disinfection process and potential cost savings. • The following is not intended to be an all-inclusive cleaning procedure but certainly any of the steps outlined below can be integrated into an existing daily cleaning protocol. • Use a new wipe on the top and front of the bed’s headboard, side rails and in between the rails. Also wipe the TV remote control and the nurse call device and cord. • Use a new wipe on the bead frame and on the coated mattress and coated pillows. Allow items to air dry. • Use a new wipe on the footboard and depending on the footboard type, make sure to wipe between the spaces and grooves. • Use a new wipe on any air vents in the room. • Using a new wipe clean the sink and counter areas including all fixtures, under the sink and all pipes. • Use a new wipe to clean all other surfaces of the bathroom including support bars and shower fixtures etc… allow all areas to air dry. • Using a new wipe to clean the toilet last. • Medipal® Detergent Wipes are made of a naturally derived solution offering excellent cleaning power with low residual smear. They are intended for use within healthcare environments for multi-surface cleaning, damp dusting and cleaning prior to disinfection. • Medipal® Patient Care Wipes and mitts are designed to gently cleanse the skin keeping it nourished, hydrated and healthy. Their Vitamin E anti-oxidant properties support skin healing and improve skin immunity while the Vitamin B5 hydrates and preserves the skin moisture keeping it healthy. • Medipal® Disinfectant Wipes contain a powerful dual biocidal solution, highly effective from 30 seconds against a wide range of pathogenic microorganisms and are intended for cleaning and disinfecting surfaces of non invasive medical devices. Using Medipal® wipes will help infection prevention teams to fight infection and ensure healthy, clinically clean environments for patients. • Medipal® Alcohol Wipes are intended for rapid disinfection of non porous hard surfaces and non invasive medical devices that are not sensitive to alcohol. Medipal® Alcohol wipes leave no visible residue on glass or stainless steel surfaces. They are made of Tritex non woven and contain 70% w/w isopropyl alcohol. Flu Season Do’s & Don’ts.